Registration is also still open for NDPC/N’s new Freshman Success Conference, “Strong Start—Successful Finish.” Freshman success can be a key determinant of on-time graduation. This event is geared toward those working with eighth- and ninth-grade students as well as transitions to high school. Four strands for this event are: designing your school for success, supporting students in their journey to success, school culture that fosters success, and instruction that defines and guides academic success. Link to http://dropoutprevention.org/conferences/the-freshman-success-conference/ to find out more about those strands and this event. This conference occurs concurrently and in the same location as the Reaching the Wounded Student Conference. Your school district may want to send a team with some attending the Reaching the Wounded Student Conference and some attending the Freshman Success Conference. The hotel discount conference rate is $145/night—and this is June, in Orlando! This conference, to be held in beautiful Palm Springs, CA, is built around several themes including New Directions in CTE/Workforce Development, a New Focus on Arts/Media/Entertainment Careers, and a New Approach to Students and Families of Trauma. This third area of focus will also address strategies for supporting migrant and undocumented students. This is NDPC/N’s largest and most attended conference each year. We’re on the West Coast, in Palm Springs, CA, this year, so please plan to join us for this exciting event. Check out the hotel location and sponsorship information. Registration is anticipated to open this month. Registration is anticipated to open this month. Visit http://dropoutprevention.org/conferences/2017-national-dropout-prevention-network-conference/ for more information. What Is a Diploma Planning Institute? Does your school or school district want to or need to develop a dropout prevention plan? NDPC/N has developed a highly successful workshop called the Diploma Planning Institute (DPI), which is designed to help teams from schools/districts/states work on written dropout prevention plans. For more information on this service, visit NDPC/N’s Web page http://dropoutprevention.org/diploma-planning-institute/ or contact NDPC/N (864-656-2599 or ndpc@clemson.edu) for additional details or to arrange a DPI for your state or region. Michigan residents register here. Non-Michigan residents register here. Link to http://dropoutprevention.org/conferences/dpi-michigan-august-2017/ for more information on the event and booking your hotel accommodations. Join a growing army of educators and practitioners identified as working with and/or on behalf of students at risk of dropping out of school. The National Dropout Prevention Specialist certification program is founded on NDPC/N’s research-based effective strategies, known youth risk factors, professional learning participation, and field implementation of acquired knowledge. This certification verifies and strengthens dropout prevention experience and expertise, and facilitates networking with others equally dedicated to dropout prevention. Visit http://dropoutprevention.org/services-certifications/national-dropout-prevention-specialist-certification-program/ for more information or to register for the certification program, or contact us at ndpc@clemson.edu with any questions. NDPC/N posts certification program completers, their bios, and their field projects on our website. Click here to see and read about this celebrated group of individuals and examples of how they implement dropout prevention in their arenas! 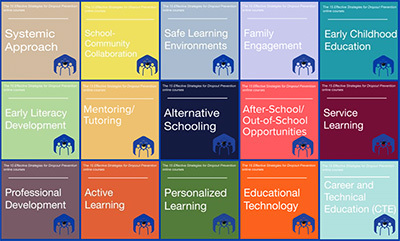 Student engagement is an effective approach to dropout prevention that aligns with the National Dropout Prevention Center/Network’s 15 Effective Strategies for Dropout Prevention. This June 13 webcast defines student engagement, shares research demonstrating the positive impacts on students, identifies conditions needed for schools to support student engagement, and provides specific strategies that can be integrated into classrooms and identifies corresponding resources. The copresenters share the recently published NPDC/N position paper, Weaving Student Engagement Into the Core Practices of Schools, that responds to eight critical questions asked about implementing student engagement in schools. They present a framework that analyzes and supports student engagement from participation, to voice, to leadership, to engagement that establishes the responsibilities of students and teachers along the continuum. Examples from preschool to high school are shared to demonstrate the successful integration of student engagement along with a focus on the context (school climate) necessary to sustain these practices. The examples illustrate strategies schools can use to guide them to implement, integrate, and sustain student engagement, leading to positive student development and the attributes and aspirations to remain in school. Solutions webcasts are always offered to you free of cost, and no registration is required. Tune in the second Tuesday of each month at 3:30 PM ET for new Solutions to the Dropout Crisis, sponsored by K12 Inc. and FuelEducation. The National Dropout Prevention Center/Network has just updated one of its most popular print products, an eight-page booklet called Do You Really Want to Drop Out? Know the Facts. With input from several student focus groups (thanks to Kent State University and to New Beginnings Academy in Lorain, OH), this booklet is aimed toward middle and high school students who may be considering dropping out. The booklet is available in packs of 50 from the NDPC/N store. The Spanish translation is coming soon. Also newly available in the NDPC/N store is a series of online course offerings on our 15 Effective Strategies for Dropout Prevention. Each course is individually priced so you can take one course or all available courses, depending on your needs, interests, and professional learning plans. Courses are self-paced and interactive, including video clips and self-assessments. All fifteen effective strategy courses are available now. Go to http://dropoutprevention.org/15-effective-strategies-online-courses/ for more information including FAQs or visit the NDPC/N store at www.dropoutprevention.org/shop to register for one or more of the 15 Effective Strategies for Dropout Prevention online courses. Erica Green with The New York Times recently published an article detailing a new executive order from President Trump. According to the article, the President has ordered a review of federal education policies by Secretary of Education Betsy DeVos, in order to pinpoint and possibly remedy any discrepancies between federal and state jurisdiction in education. You can read the article here. You can also read about cuts in President Trump’s proposed budget in the CNN article “Trump’s budget by the numbers: What gets cut and why,” including highlights of some education budget cuts. You can find more about highlighted changes specific to education in the FY 2018 Budget section of ED Review, the U.S. Department of Education’s biweekly news update. Strategic Partnerships Inc. has highlighted the Texas High School Project (THSP), a public-private partnership focused on remedying the problem of high school dropouts by connecting with schools and communities. THSP partners with high schools, colleges, universities, tech schools, and businesses to provide comprehensive education assistance. Read an article about the project here, or find out more about THSP at their website. NDPC/N Research Fellow, Dr. Robert Shumer, has edited a new book, Where’s the Wisdom in Service-Learning, available in hardback and paperback from Information Age Publishing, Amazon, and other sources. Dr. Shumer has been a researcher and youth learning advocate in service-learning and youth and community engagement for decades and served as director of the National Service-Learning Clearinghouse. His book brings us writings from individuals who have also long been involved in service-learning efforts, some with more than 30 or 40 years in the field. By pointing to the wisdom in service-learning, contributors to the book show us the way forward in learning and engaging through service. High school senior, Ashley Castillo, recently shared how much the After-School All-Stars program in Orlando, FL, meant to her and her family. Read a blogpost from the Afterschool Alliance blogspace, Afterschool Snack, and watch this video of Ashley delivering her speech on Capitol Hill. A growing trend is for local industries and employers to work with school systems, benefitting these industries with a more prepared workforce, benefitting the school systems through various collaborate efforts and the potential to improve students’ skills and awareness of the value of education, and benefitting the communities through improved economies and lower unemployment. Georgia Power, for example, provides support for educational initiatives throughout the state of Georgia, emphasizing the importance of math, science, electric safety, and energy efficiency for students. They also focus on building awareness around energy careers. Read more about their programs and partnerships here. The U.S. Department of Education has recently improved their Individuals with Disabilities Education Act (IDEA) website to make it more user-friendly and up-to-date with relevant news and information. Visit the revamped site here to experience the improved design and find new resources. Grants of up to $1,000 will be awarded in support of environmental projects that demonstrate service-learning, exemplify student voice, and involve at least one community partner. Portland General Electric is accepting applications for a grant to support organizations that use preventive approaches designed to help Oregon families create stable environments in which children can grow and thrive, with a focus on food insecurity, housing/homelessness, mental wellness, and parent engagement. Grant amounts will be determined on a project-by-project basis. The foundation (serving children between the ages of birth to 20 years residing in the state of Maine) is accepting applications for its Adaptive Equipment/Assistive Technology/Therapy Treatment (AAT) Program. The AAT program is open to children with special needs who would benefit from adaptive equipment, assistive technology, therapy treatment, and/or any other essential item not covered by insurance or any additional funding resource. Grants will pay for items and services that help maximize growth and development and create an easier and more enjoyable learning and/or living environment for a child. Applications are accepted and reviewed quarterly (Jan, Apr, Jul, and Oct). Available funds are fluctuating and items are funded by date received until funds are depleted. Grants of up to $60,000 will be awarded to support the implementation of evidence-based and innovative programs aimed at increasing children’s knowledge of and attitudes toward healthy eating, leading to healthier nutrition behavior change.